If you'd like this slightly enhanced edition, choose "With friction glow". Choose from two editions - with friction glow or without! 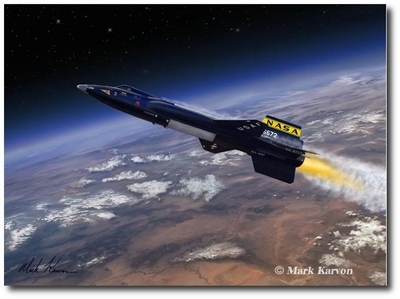 The X-15 was designed to explore hypersonic speeds in excess of Mach 6 and altitudes over 300,000 feet. The aircraft was powered by a rocket engine dubbed "the million horsepower engine". There were three X-15 aircraft built and they were flown from 1959 though 1968. On August 22, 1963, flying the number 3 aircraft, pilot Joe Walker set a new altitude record of 354,000 feet. Such altitudes are considered above Earth's atmosphere. For this reason many of the X-15 pilots were awarded astronaut pins. Sadly, Joe Walker lost his life when the F-104 Starfighter he was flying collided with another high performance aircraft, the XB-70 Valkyrie. Both aircraft were lost.